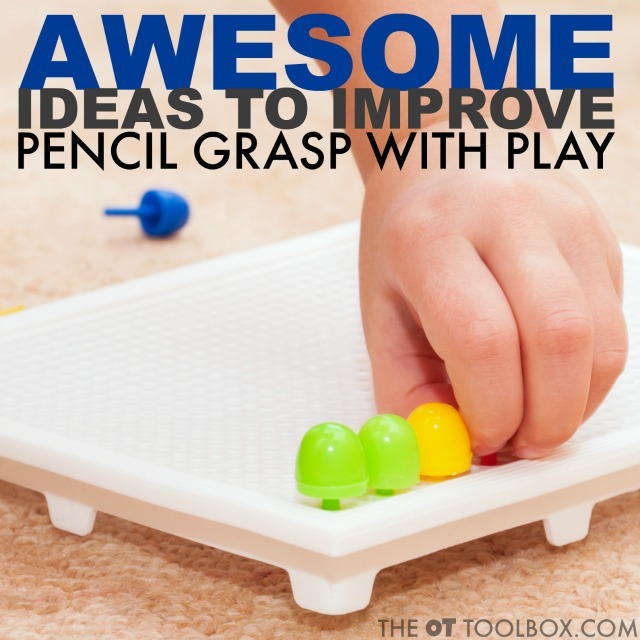 I love to share easy tricks to work on things like fine motor skills. Working on pencil grasp and the fine motor skills needed for handwriting are two of my favorite ways to build functional skills as an Occupational Therapist. 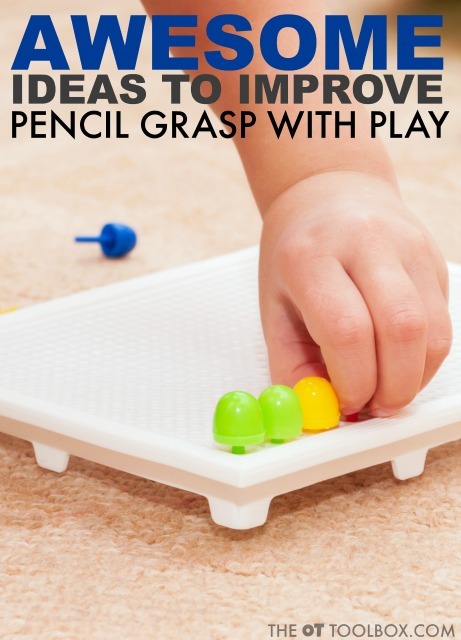 This blog post is a round up of some of the best ways to develop a more functional pencil grasp through fine motor play activities. 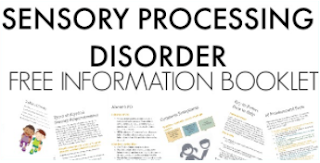 I've updated this resource to include more recent activities that I've shared. 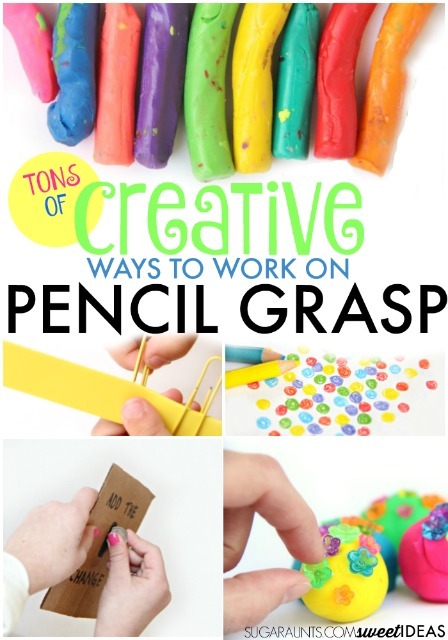 First, if you've go questions about pencil grasp, visit this page. It's all about fine motor skills and play, however, you will find TONS of info about the fine motor "parts" of a functional grasp. We love incorporating fine motor activities into our play. These posts are some of our favorites from the past year, and as a bonus, will help with the development of the small muscles of the hands. An efficient grip on the pencil uses a tripod grasp (thumb, index, and middle fingers) with an open space between the thumb and index finger. 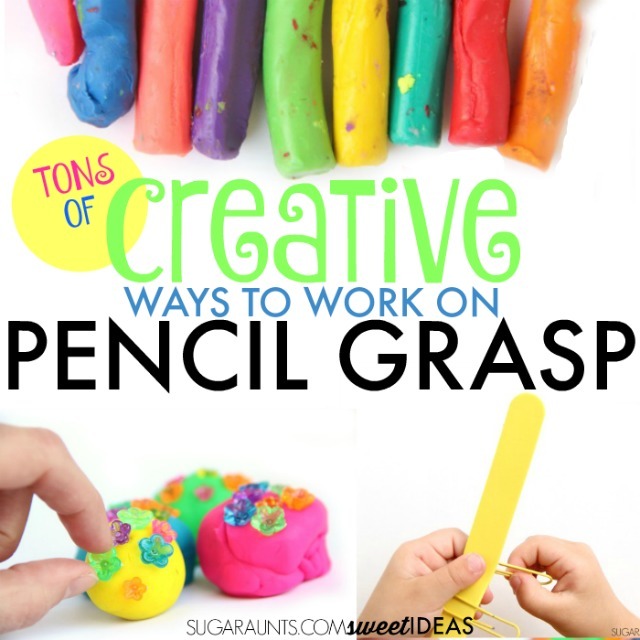 This grasp on the pencil allows kids to better form letters correctly and in a given small space using the fingers to make the pencil movements, vs. using the wrist or whole arm. 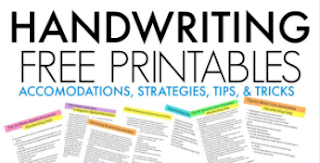 If your child is struggling with their handwriting, look first at their grasp on the pencil and go from there. Try one of these activities for improved muscle strength and pencil control. 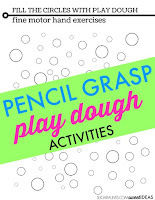 Pencil Grasp Exercises with Play Dough is fun with these mini fluted flower beads. They build a flexed thumb IP joint which is needed for an efficient pencil grasp. Hand Strengthening Exercises are fun with tongs! 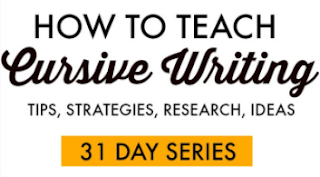 They are an easy tool to build so many handwriting skills. These Craft Stick Tweezers build muscle strength, an open web space, and tripod grasp. Play Dough Strengthening Mat works on building the intrinsic muscle strength of the hands. Fine Motor Development with Blocks is a great way to build many skills needed in handwriting. In Hand Manipulation with Coins can help build skills needed for pencil grasp like manipulating the pencil during letter formation. Thumb Opposition is an important skill needed for an open thumb web space and functional and efficient grasp on the pencil. Mini Circles Pencil Control Exercises help with building small motor movements and tripod grasp through improved intrinsic muscle strength. Finger Isolation with Play Dough helps with minute movements of the hands and individual finger movements in managing the pencil. Clay Exercises can help strengthen the muscles of the hand for increased endurance of pencil grasp. Motoric Separation of the Hand is essential for managing the pencil while utilizing the ulnar, stability side of the hand. Fine Motor Play with Tissue Paper is a great way to build intrinsic muscle strength. Strength in the intrinsic muscles ensure a functional tripod grasp. In-Hand Manipulation: Two Activities In hand manipulation is necessary during pencil grasp to manipulate and advance the pencil while writing, as well as making adjustments with the pencil while erasing. Fine Motor Table-Top Play addresses intrinsic muscle strengthening. 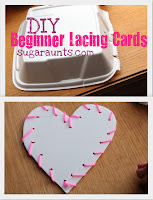 DIY Lacing Cards improves bilateral coordination, needed for holding the paper while writing. 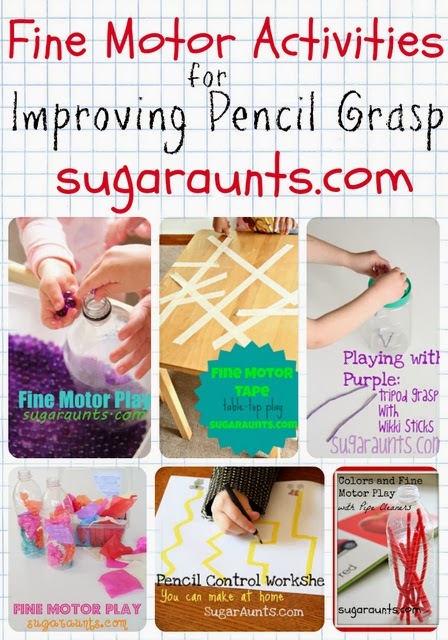 Pipe Cleaner Fun builds tripod grasp for use with handwriting. Fine Motor Strengthening Color Match works on increasing the intrinsic muscle strength of the hands. 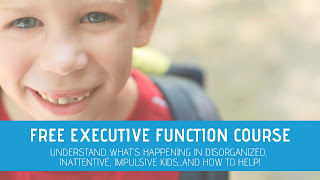 Pencil Control Worksheets You Can Make at Home These worksheets build pencil control, line awareness, and spatial awareness during handwriting. Learning With Dyed Pasta provides a fun activity for building eye hand coordination. Manipulating Coins for Fine Motor Development is a great way to work on in-hand manipulation needed for manipulating the pencil during handwriting. Rainbow Writing provides a resistive writing surface, providing proprioceptive feedback and a way to work on motor planning in letter formation, as well as tripod grasp on the pencil. Tripod Grasp with Wikki Stix Pushing the wikki stix into the container works on tripod grasp and intrinsic muscle strength, as well as bilateral coordination. Using Pipe Cleaners in Fine Motor Play also improves intrinsic muscle strength and bilateral coordination with a brightly colored stick. Using the plastic bottle provides great auditory feedback. Play hand games like "where is thumbkin"